I will detail how the Washington elites sought to replace the lost global dollar demand that had been artificially created through the Bretton Woods system. Their solution would come in the form of something known as the Petrodollar system. The three primary benefits that the Petrodollar system provides to America will be explained. And finally, the article will conclude with an brief examination of how the Petrodollar system has influenced U.S.-Middle East relations with a specific focus on Israel. The Same Game with a New Name: "Dollars for Oil" Replaces "Dollars for Gold"
In the early 1970s, the final vestiges of the international gold-backed dollar standard , known as the Bretton Woods arrangement, had collapsed. Many foreign nations, who had previously agreed to a gold-backed dollar as the global reserve currency, were now having serious mixed feelings toward the arrangement. Nations like Britain, France, and Germany determined that a cash-strapped and debt-crazed United States was in no financial shape to be leading the global economy. They were just a few of the many nations who began demanding gold in exchange for their dollars. Despite pressure from foreign nations to protect the dollar's value by reining in excessive government spending, Washington displayed little fiscal constraint and continued to live far beyond its means. It had become obvious to all that America lacked the basic fiscal discipline which could prevent a destruction of its own currency. Like previous governments before it, America had figured out how to "game" the global reserve currency system for its own benefit, leaving foreign nations in an economically vulnerable position. After America, and its citizens, had tasted the sweet fruit of excessive living at the expense of other nations, the party was over. It is unfair, however, to say that the Washington elites were blind to the deep economic issues confronting it in the late 1960's and early 1970's. Washington knew that the "dollars for gold" had become completely unsustainable. But instead of seeking solutions to the global economic imbalances that had been created by America's excessive deficits, Washington's primary concern was how to gain an even greater stranglehold on the global economy. After America, and its citizens, had tasted the sweet fruit of excessive living at the expense of other nations, there was no turning back. In order to ensure their economic hegemony, and thereby preserve an increasing demand for the dollar, the Washington elites needed a plan. In order for this plan to succeed, it would require that the artificial dollar demand that had been lost in the wake of the Bretton Woods collapse be replaced through some other mechanism. According to John Perkins, author of Confessions of an Economic Hit Man: The Shocking Story of How America Really Took Over the World, that plan came in the form of the petrodollar system. But what exactly is the petrodollar system? First, let’s define what a petrodollar is. A petrodollar is a U.S. dollar that is received by an oil producer in exchange for selling oil and that is then deposited into Western banks. Despite the seeming simplicity of this arrangement of "dollars for oil," the petrodollar system is actually highly complex and one with many moving parts. It is this complexity that prevents the petrodollar system from being properly understood by the American public. Allow me to provide a very basic overview regarding the history and the mechanics of the petrodollar system. It is my belief that once you understand this "dollars for oil"arrangement, you will gain a more accurate understanding of what motivates America’s economic (and especially foreign) policy. The petrodollar system originated in the early 1970s in the wake of the Bretton Woods collapse. 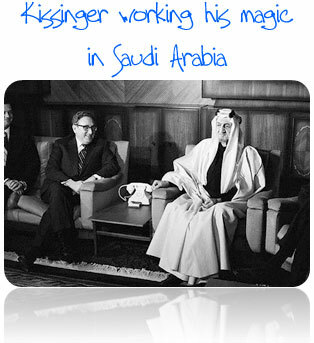 In a series of meetings, the United States — represented by then U.S. Secretary of State Henry Kissinger — and the Saudi royal family made a powerful agreement. (Several authors have worked to compile data on the origins of the petrodollar system, some exhaustively, including: Richard Duncan, William R. Clark, David E. Spiro, Charles Goyette and F. William Engdahl). According to the agreement, the United States would offer military protection for Saudi Arabia’s oil fields. The U.S. also agreed to provide the Saudis with weapons, and perhaps most importantly, guaranteed protection from Israel. The Saudis would be open to investing their surplus oil proceeds in U.S. debt securities. You can almost hear one of the Saudi officials in a meeting saying: "Really? That's all? You don't want any of our money or our oil? You just want to tell us how to price our oil and then you will give us weapons, military support, and guaranteed protection from our enemy, Israel? You've got a deal!" However, the U.S. had done its economic homework. If they could get the Saudis to buy into this deal, it would be enough to launch them into the economic stratosphere in the coming decades. Fast forward to 1974 and the petrodollar system was fully operational in Saudi Arabia. And just as the United States had cleverly calculated, it did not take long before other oil-producing nations wanted in. By 1975, all of the oil-producing nations of OPEC had agreed to price their oil in dollars and to hold their surplus oil proceeds in U.S. government debt securities in exchange for the generous offers by the U.S.
Just dangle weapons, military aid, and guaranteed protection from Israel in front of third world, oil-rich, Middle East nations… and let the bidding begin. Nixon and Kissinger had successfully bridged the gap between the failed Bretton Woods arrangement and the new Petrodollar system. The global artificial demand for U.S. dollars would not only remain intact, it would soar due to the increasing demand for oil around the world. And from the perspective of empire, this new "dollars for oil" system was much more preferred over the former "dollars for gold" system as its economic requirements were much less stringent. Without the constraints imposed by a rigid gold standard, the U.S. monetary base could be grown at exponential rates. It should come as no surprise that the United States maintains a major military presence in much of the Persian Gulf region, including the following countries: Bahrain, Iraq, Kuwait, Oman, Qatar, Saudi Arabia, United Arab Emirates, Egypt, Israel, Jordan, and Yemen. While the U.S./Saudi agreement may have smelled of desperation at a time of decreasing global dollar demand, it can now be considered one of the most brilliant geopolitical and economic strategies in recent political memory. Today, virtually all global oil transactions are settled in U.S. dollars. (There are a few exceptions and they will be highlighted in our next article appropriately titled, The Petrodollar Wars.) When a country does not have a surplus of U.S. dollars, it must create a strategy to obtain them in order to buy oil. The easiest way to obtain U.S. dollars is through the foreign exchange markets. This is not, however, a viable long-term solution as it is cost-prohibitive. Therefore, many countries have opted instead to develop an export-led strategy with the United States in order to exchange their goods and services for the U.S. dollars that they need to purchase oil in the global markets. (This should help explain much of East Asia’s export-led strategy since the 1980's.) Japan, for example, is an island nation with very few natural resources. It must import large amounts of commodities, including oil, which requires U.S. dollars. So Japan manufactures a Honda and ships it to the United States and immediately receives payment in U.S. dollars. Problem solved… and export-led strategy explained. The petrodollar system has proven tremendously beneficial to the U.S. economy. In addition to creating a marketplace for affordable imported goods from countries who need U.S. dollars, there are more specific benefits. In essence, America receives a double loan out of every global oil transaction. First, oil consumers are required to purchase oil in U.S. dollars. Let's briefly examine each one of these benefits. 1. The petrodollar system increases global dollar demand. Why is consistent global demand for the dollar a benefit? In many ways, currencies are just like any other commodity: the more demand that exists for the currency, the better it is for the producer. To help illustrate this point, let's imagine that you decided to open a hamburger stand in a small town with a population of 50,000. Of course, not everyone likes hamburgers, so only a certain percentage of your town's population will actually ever be a potential customer. And since you are obviously not the only hamburger stand in town, your competitors will all be attempting to reach the same portion of your town's population as you are. Would you rather have demand for your burgers from your own town and nearby communities only… or would you prefer to have all of the hamburger demand in your entire state? Once again, the answer should be obvious. Every good business understands that increasing consumer demand is a good thing for their company's bottom line. Imagine that Oprah Winfrey is driving through your state and just so happens to stop in at your growing hamburger stand. (I know… this is getting ridiculous… just bare with me. I really do have a point here.) After Oprah tries your hamburger, she expresses utter amazement at your culinary skills. Oprah is now a raving fan of your burger joint and invites you onto her show to tell the whole world about your hamburgers. It doesn't take an economist to figure out what is going to happen to the demand for your burgers… it is going to skyrocket. Your hamburger demand is now global. Congratulations! As the demand for your hamburgers is increases dramatically, so too the supply must increase. Your newfound global hamburger demand has given you a "permission slip" to buy even more frozen patties and hire new fry cooks. The important concept here is that a growing demand "permits" the producer to increase his supply. Now, let's conclude our hamburger illustration by imagining that an up and coming rival hamburger company becomes a major competitor with your hamburger restaurant chain. As many of your customers begin visiting your new competitor, the demand for your hamburgers begins to wane. As the demand for your burgers drops, you no longer have a "permission slip" to buy as many frozen patties as you had before. As demand for your burgers continues to fall, it makes little sense to hire more workers. Instead, to remain competitive, you must lay off workers and buy fewer frozen patties just to keep your company afloat. Furthermore, you may even need to sell your existing burgers at a discount before they spoil. If you decided to ignore the warning signs and continue hiring new employees and buying more patties than were actually demanded by your customers, you would soon find your company nearing bankruptcy. At some point, logic would dictate that you must decrease your supply. How it all applies to the U.S. Dollar: Now, let's apply the same economic logic that we used to explain the increasing and decreasing demand for your hamburgers to the global demand for U.S. dollars. If it is only Americans who "demand" U.S. dollars, then the supply of dollars that Washington and the Federal Reserve can "supply", or create, is limited to our own country's demand. However, if Washington can somehow create a growing global demand for its paper dollars, then it has given itself a "permission slip" to continually increase the supply of dollars. This is exactly the type of scenario that the petrodollar system created in the early 1970's. By creating incentives for all oil-exporting nations to denominate their oil sales in U.S. dollars, the Washington elites effectively assured an increasing global demand for their currency. As the world became increasingly dependent on oil, this system paid handsome dividends to the U.S. by creating a consistent global demand for U.S. dollars. And, of course, the Federal Reserve's printing presses stood ready to meet this growing dollar demand with freshly printed U.S. dollars. After all, what kind of central bank would the Federal Reserve be if they were not ready to keep our dollar supply at a level consistent with the growing global demand? FACT: The artificial dollar demand created by the petrodollar system returned to Washington the "permission slip" to supply the global economy with freshly printed dollars that it lost after the demise of the Bretton Woods agreement. The artificial dollar demand created by the petrodollar system has "permitted" Washington to go on multiple spending sprees to further create their "welfare and warfare" state. And with so many dollars floating around the globe, America's asset prices (including houses, stocks, etc.) naturally rose. After all, as we have already demonstrated, prices are directly related to the available money supply. When, not if, the petrodollar system collapses, America will lose its "permission slip" to print excessive amounts of U.S. dollars. When this occurs, the amount of dollars in existence will far exceed the actual demand. This is the classical definition of hyperinflation. Since 2006, I have been teaching that America's bout with hyperinflation will be tied in some way with a breakdown of the petrodollar system and the artificial dollar demand that it has created. When hyperinflation strikes America, it will be very difficult to stop without drastic measures. One possible measure will be a quick and massive reduction in the overall supply of U.S. dollars. However, with a reduction of the supply of dollars will come a massive reduction in the value of assets currently denominated in U.S. dollars. One of the most brilliant aspects of the petrodollar system was requesting that oil producing nations take their excess oil profits and place them into U.S. debt securities in Western banks. This system would later become known as “petrodollar recycling” as coined by Henry Kissinger. Through their exclusive use of dollars for oil transactions, and then depositing their excess profits into American debt securities, the petrodollar system is a "dream come true" for a spendthrift government like the United States. Despite its obvious benefits, the petrodollar recycling process is both unusual and unsustainable. It has served to distort the true demand for government debt which has "permitted" the U.S. government to maintain artificially low interest rates. Washington has become dependent upon these artificially low interest rates and, therefore, have a vested interest in maintaining them through any means necessary. The massive economic distortions and imbalances generated by the petrodollar system will eventually self-correct when the artificial dollar and U.S. debt demand is removed. A third major benefit of the petrodollar system for the U.S. has to do with the actual purchase of oil itself. Like all modern developed economies, the United States has built most of its infrastructure around the use of petroleum-based energy supplies. And like many nations, the U.S. consumes more oil each year than it is able to produce on its own. Therefore, it has become dependent upon foreign nations to fill the supply gap. What makes America different, however, is that it can pay for 100% of its oil imports with its own currency. Again, it does not take much economic knowledge to figure out that this is a great deal. Let's use another quick example. Imagine that you and I both live in a unusual city where the only method of payment for gasoline for our automobiles is carrots. Now, imagine that I own the exclusive rights in our town to grow carrots and I have the only existing carrot farm in our town. For you, this means that in order to buy any gasoline, you must first deal with me. You can come and attempt to barter with me, or you can buy carrots from me. But regardless, it is an inconvenient fact of life for you. However, it is exactly the opposite for me. Since I can create carrots out of the ground, I just plant a seed, water the seed, and then exchange the carrot for gasoline. America has managed to create a similar place for itself in an oil-dependent global economy. With oil priced in U.S. dollars, America can literally print money to buy oil… and then have the oil producers hold the debt that was created by printing the money in the first place. What other nation, besides America, can print money to buy oil and then have the oil producers hold the debt for the printed money? Obviously, the creation of the petrodollar system was a brilliant political and economic move. Washington was acutely aware in the early 1970's that the demand curve for oil would increase dramatically with time. Therefore, they positioned the dollar as the primary medium of exchange for all global oil transactions through the petrodollar system. This single political move created a growing international demand for both the U.S. dollar and U.S. debt — all at the expense of oil-producing nations. For a very simplistic video explanation of the petrodollar system by Jerry Robinson, watch the video, "The Shocking Truth About the U.S. Dollar" (YouTube). Before we conclude, there is one politically sensitive topic that needs to be addressed that will help further clarify the true effects of the petrodollar system. Namely, how the petrodollar system has affected America's relationship with Israel. If you were to ask most Americans today if the United States has been a close friend and ally of Israel, most would answer with a resounding "yes." This is especially true of Evangelical Christians who believe that America's foreign policy in the Middle East should be driven, and even dictated, by Israel. Evangelicals often side with Republican candidates who promise to "look out for" Israel and to "stand up for" Israel. But, is there any solid evidence that America's foreign policy measures and actions in the Middle East have been guided by anything but upholding and protecting the petrodollar system? I would strongly suggest that the answer is no. Why is this important? Because I believe that the American population, and Evangelicals in particular, have been hoodwinked with the "pro-Israel" chatter that pours out of most our political leader's mouths. Still, many Americans, including most Evangelicals, buy the hype being pumped out of Washington's political spin rooms. If you turn off the corporate-controlled mainstream media for a day, however, and speak to the real inhabitants of the Middle East, a very different story emerges. Would a true friend belittle your autonomy and self-determination by denying your right to defend yourself, all because they have made backroom deals with your enemies for financial gain? Would a true friend seek to make you dependent upon financial aid and then give eight times more financial aid to your sworn enemies? Yet, this is exactly what America has done to Israel in the name of "friendship." When Israel seeks to defend her territory, America always rushes to prevent it. Have you ever found yourself asking why America, and other Western interests who benefit from continued good relations with oil-producing nations, urge Israel to restrain herself? After all, who are we to intervene in a sovereign nation's foreign policy decisions? As you may recall, part of the petrodollar agreement requires that the United States guarantee protection for Middle Eastern oil-producing nations from the threats specifically imposed by the Jewish state. When dispensing foreign aid into the Middle East, does America give money exclusively to Israel and her allies? No. Instead, Israel's sworn enemies receive eight times more in foreign aid than Israel does. How can you give free money and weapons to the enemies of your so-called "best friend" and keep a straight face? While the masses clamor at the feet of those leaders who profess "support for Israel," I would suggest that they have rarely stopped to ask what that American "support" really looks like? The Jewish identity, as expressed in Zionism, is one that is deeply rooted in autonomy and self-determination. It is my belief that America's so-called "support" for Israel has served as a crafty cover for maintaining a military presence in the region… all to protect our national interests. America has attempted to play both sides of this Middle East game for far too long. And it has used the corporate-controlled media to control the American public for decades. They have kept us ignorant of the truth. Keeping the Middle East inflamed and destabilized has been a stated goal of Western interests for decades. This is the name of the game when your goal is empire. And empires do not have friends… they have subjects. It is time that Americans wake up and realize that we need to stop listening to the flapping jaws of the politicians and to the derelict corporate-controlled media, and instead, we should follow the money. Maintaining the petrodollar system is the American empire's primary goal. Everything else is secondary.